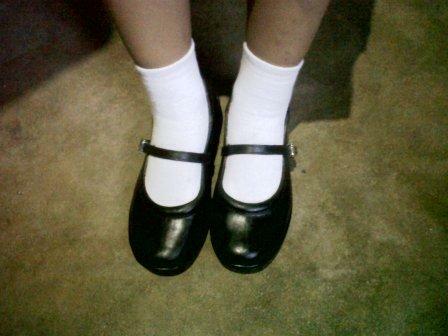 Stay at Home Blessings: What is a Good Brand of School Shoes for Kids? What is a Good Brand of School Shoes for Kids? 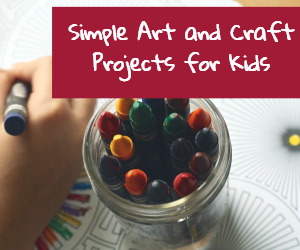 Do your kids easily wear out their shoes? How often do you buy them new shoes? What brand do you prefer? Do you think more expensive shoes are more durable? 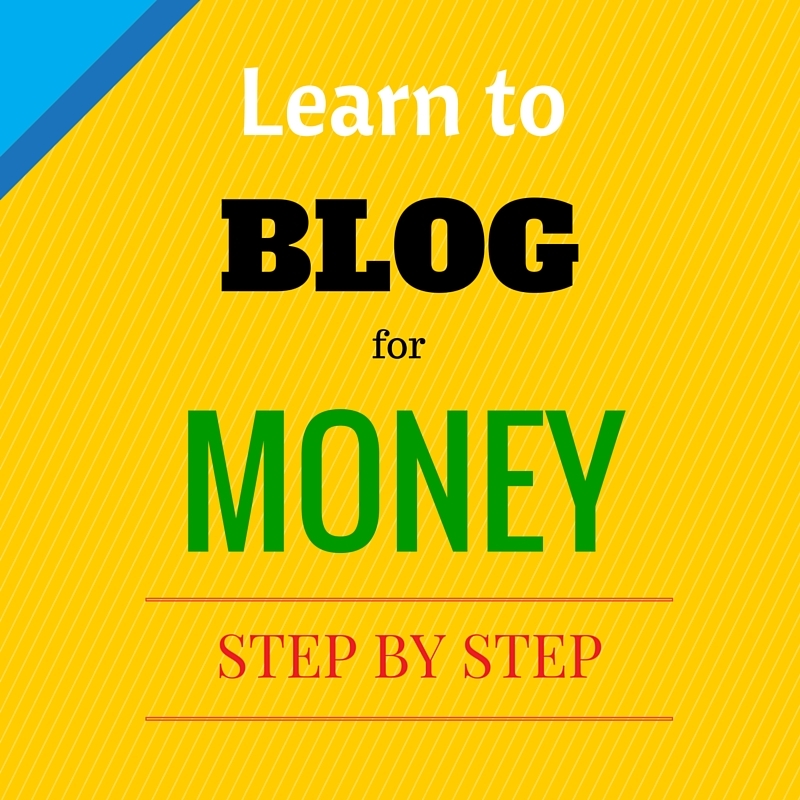 Outgrowing Shoes or Wearing Them Out? 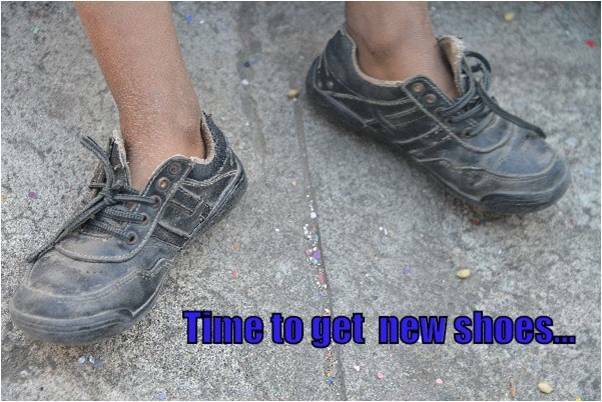 When we were still residing in Saudi Arabia, I usually only buy new shoes for my kids when they have outgrown their old one or when they need a different kind of shoes. It’s very seldom that we have to repair their shoes for loose soles (nakanganga na swelas) or worn thin soles (pudpod na swelas). But when we came back to the Philippines, my kids’ shoes often needed repair, especially gluing together the upper part of the shoe to the sole with rugby. Now, I would understand it if the shoes were not branded, but they were. I think the weather has a lot to do with this. First, it’s humid in the Philippines. Second, when it rains, the kids’ can’t help getting the shoes wet and muddy, sometimes. In KSA, the road is always dry and clean. Aside from the weather, I know that the wearer has something to do with the durability of the shoes as well. You know, the way a person walks and how his feet is shaped, affect it. My 2 sons, Em and Yu, and 2 daughters, Kristel and Angel, can wear any pair of shoes for a long time. I can buy any brand and they can wear them until they couldn’t fit anymore. 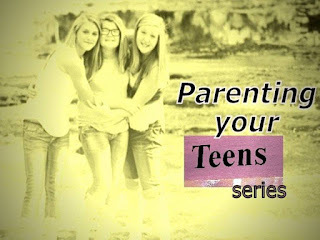 I remember buying my 3 girls a pair shoes each at Payless Shoes during a sale about 3 years ago. 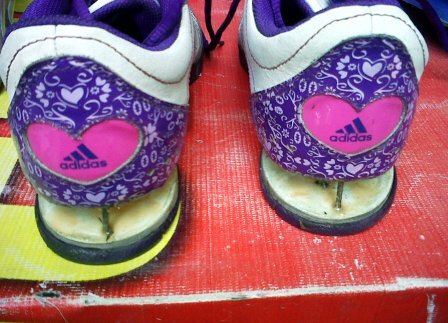 It’s amazing that the 2 girls were able to wear the shoes for almost 3 years. If they had not outgrown them, they would still be wearing them. 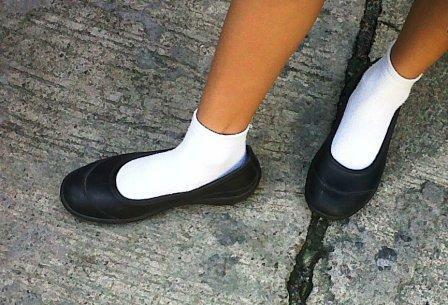 I remember buying 2 pairs of school shoes for her, both made in Marikina, but one is for P350 and another for P1000. After only 2-3 months of wearing, the 2 pairs have almost the same condition — the soles are already worn thin with many scratches. I asked Mr. Quickie if they can fix the shoes, they said they can replace the soles. But I think it’s not advisable anymore, because the repair cost is approximately P300. Just add a little more and you can already buy a new pair. Before this school year started, we went to the mall to buy shoes for the kids. Well, not for all of them because the others can still wear their old shoes. It took us time to find a good pair of shoes for Janel since we didn’t have a specific brand in mind. When I saw the Easy Soft Shoes by World Balance, I really thought that this might be the one that Janel needs. Looks very durable, soft and comfortable to wear. They’re a bit heavier than other leather shoes, though, because they are not made of leather but sort of rubber. They call it VICRO-tech material. Anyway, we decided to buy Janel a pair and try them out. It was very affordable, just P350. It’s now September, 3 months since we bought the shoes, and they still look good. There’s just very slight thinning of the soles, barely noticeable. I’m so happy that they lasted that long, and I believe Janel can wear them until the end of school year, maybe beyond if they still fit. What savings! Two Sundays ago, we went to the mall again because Angel’s school shoes which we bought 3 years ago don’t fit anymore. I told her that we will buy her an Easy Soft shoes, too, like Ate’s. She was very happy. 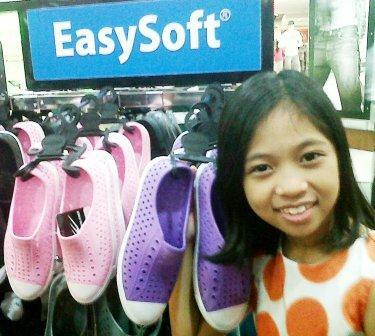 By the way, I didn’t see before that Easy Soft sells shoes in other colors also. Cool! I honestly recommend Easy Soft shoes, especially if your kids tend to easily deteriorate the shoes they wear. Do you have other brands of shoes that you can recommend that are both durable and affordable?